While it continues to be strong, season 6 shows Kingof the Hill just starting to run out of ideas. Some held in reserve are at last dealt with, like a Boomhauer episode fleshing him out to finally give him another dimension, and Dale deciding Joseph isn’t his biological son – though of course assumes he’s half-alien. Strong new characters include Dale’s father, who forces the gang to contemplate homosexuality – which they do in typically childish but thankfully non-vicious fashion – and a silly turn for Alan Rickman as a king at a renaissance faire. 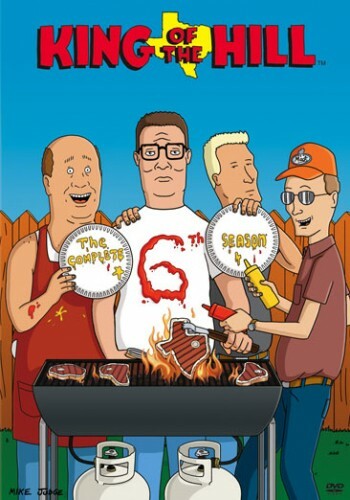 The Rickman episode is about as absurd as King of the Hill should ever get, still being in the realms of the feasible, where going to Japan to discover Hank has a half-brother, Luanne being suckered into joining a cult, Bill stealing an army tank for a drunken rampage and Hank being honoured as the token white guy in an Asian golfing country club all go a bit too far. Peggy, previously the believably self-centred yet insecure centre of the funniest episodes, has some episodes where her self-regard goes a bit ridiculous. I can accept her accidentally taking home a Mexican child, but pretending to be a nun or taking Hank to a nudist colony was just bizarre. Some episodes stretched too far at the end, like Hank extinguishing the Olympic torch in front of news cameras but them accepting it being relit by a cigarette on Bobby’s testimony, or Peggy falling for a scam but putting together a double-bluff at the end that goes perfectly. Bobby and Connie are probably the most believable and relatable part of the series at this stage. I still want to watch more, but the show is losing its natural edge. I hope the next season is a bit more down-to-earth, but it will need some fresh ideas.